Bird Soap Dish Gift Mothers' Day Teacher Gift Housewarming Vintage Design with a Bird Available in you favorite color too! 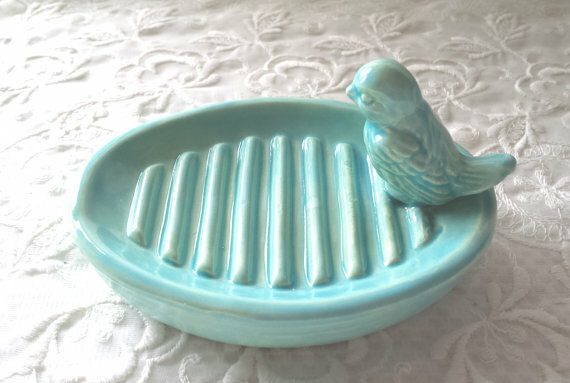 The sweetest vintage little bird soap dish! It measures 4.25" across from left to right edge of bird tail, and 3" across. I pour the little bird and the dish from vintage molds. I carefully attach the little bird to the dish.I let the clay dry then I clean the dish, then fire to bisque. I then glaze with your favorite color and fire again for the enamel high gloss finish. A perfect housewarming gift, wedding gift, or birthday to add to your home decor. Available in your favorite color too, convo me for a color chart if not in dropdown!